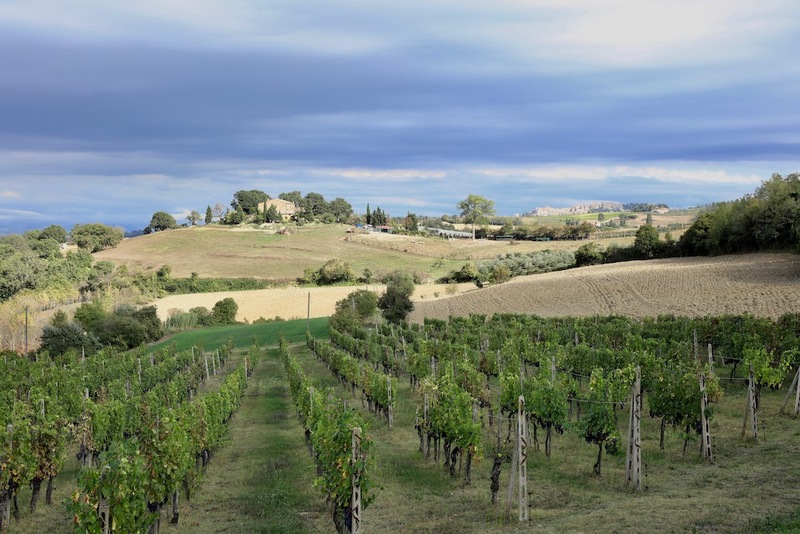 The view from our home-away-from-home tucked into the rolling Tuscan hills was hypnotic. Before us, an olive grove flowed down the slope, the intermingled fruit and cypress trees creating a jigsaw of sun-softened green hues before reaching the Val de Chiana and its patchwork of meadows filled with late-summer sunflowers and hay bales. Across the valley, a full moon rose from the hills behind Cortona, the town’s twinkling early-evening lights the support show for the celestial display waiting to unfold. We expected nothing less really, the landscape was perfection. Senses enlivened and views committed to memory (some settings just can’t be replicated on film), we joined fellow guests for a pre-dinner drink on the patio, the Aperol Spritz the perfect colour match for the last cast of peach emanating from Villa Fontelunga as the day’s light faded. Conversation flowed as cares evaporated, everyone happy to share tips on where to find the best off-the-tourist-radar, family-run restaurants known to showcase the region’s bounty, and which medieval villages have best ignored the march of time. Should you need touring or gastronomic guidance, the Fontelunga guide book, curated and added to by the owners over the years, will ensure every need and curiosity is catered to - restaurant-wise, Osteria della Lodola is one of their personal favourites. My advice - arrive sans plan, let the Fontelunga team guide you and give yourself time to explore. Villa Fontelunga itself is one of the local treasures, and staying here allows you to become part of its story - which began nearly 20 years ago when Paolo Kastelec and Philip Robinson found the property, empty for over three years yet still majestic in its run-down state. For them it was love at first sight and they set about renovating the villa, the line between hotel and home blurring as the venture developed. Over time the project has grown, with two beautifully appointed, rosemary-surrounded, self-catering cottages - Villa Gallo and Villa Galletto - a short drive away. Designed to feel like a walled garden, these properties have been built using bricks salvaged from an old farmhouse that stood on the sites, a perfect example of Fontelunga's ability to marry the old and the new. The pastel-palette within is instantly soothing; a dreamy England-meets-Tuscany style that here, in this setting, could not be more perfect. With a series of villas presently under construction, Paolo and Philip's creative energy and enthusiasm will continue to ensure that authentic accommodation under the Tuscan sun remains available. At a time when luxury is often affiliated with labels and anonymity, style can sometimes appear unvaried, yet at Villa Fontelunga this dynamic duo have followed their passions and created decor with a unique sense of vogue impossible to pigeon-hole. There’s obviously an art to being this creative though, of having the ability to combine the whimsically eclectic with the traditional to produce a setting that's both liveable and luxurious, bravely individual yet fashionably sophisticated, and curated in a way that encourages guests to feel right at home. To add to the decadent homeliness of it too, Villa Fortelunga also hosts cooking classes and dinner parties, the women of the local village preparing authentic Italian fare you'll find impossible to forget. Whether you see it as a boutique retreat, Tuscan farmhouse, bed and breakfast or luxury hotel, everyone can find their “perfect spot” here. Then again, what else would you expect from the set designer behind iconic filmic work like Four Weddings & A Funeral, Mr Bean and Howard's End. Lounge areas have shelves lined with books, magazines and rolled blankets ready for those chillier evenings, and comfy cream sofas are bedecked with lime faux fur cushions and the hotel's resident canines. Double doors opening to the outside reveal terracotta pots brimming with greenery, a resplendent garden, covered gazebo with atmospheric outdoor fire and soft seating, landscaped pool and jacuzzi (looking over the valley as the water bubbles away is surprisingly meditative) and a distant tennis court through the olive grove. Above the stairwell to the nine bedrooms, a Sistine Chapel-like fresco adorns the roof, the electric blues and cherubic, red-lipped women leading you to the boudoirs, each a one-of-a-kind celebration of precious minerals such as "Ametista" (Amethyst) and “Tormalina” (Tourmaline). I was in “Oro” (Gold), the bedcovers, bedheads and curtains an opulent yet cosy expression of golden shades and perfectly offset by the white walls, terracotta floors and magical views from the double windows. This was a space I had no desire to leave. Here return visits are inevitable. To find out more and book a room, click here.